Editorial: Dear Nokia, you cannot be serious! At first blush, the Nokia N9 is everything I'd ever wanted from the company: a smartphone with a competitive spec sheet, exquisite industrial design, and a touch-centric UI that looks to push things forward with the introduction of its own idiosyncratic ideas. Slick in terms of both responsiveness and appearance, the Harmattan interface is Nokia's thunderous riposte to all those (myself included) that challenged the company to get with the touchscreen OS program and cast off the shackles of its Symbian legacy. The only traces of Symbian in the MeeGo 1.2-equipped N9 can be found in the iconography, which maintains the rounded look of its forebear, and support for Qt -- in all other respects, this is a whole new software proposition (distinct even from its Maemo 5 roots), which has so far elicited a range of emotions in me, including delight, desire, and... despair. You must be wondering why, aside from alliterative convenience, I'd be feeling downcast having enjoyed my brief time with the N9 so much. To learn the answer, read on. The date is February 9th, 2011, a Wednesday just like today, and I'm penning my part in a four-way Engadget editorial about what we expect Nokia will be announcing on February 11th. Having, over the previous eighteen months, been fed a steady diet of unfulfilled promises about the transformation of Symbian and the introduction of Maemo 6 / MeeGo, I was convinced that Nokia had lost its direction and needed the stability of an external and up-to-date OS to steady its course into the future. The newly appointed CEO Stephen Elop seemed emphatically in agreement with this viewpoint and made the announcement later on that week that Nokia would be abandoning all heretofore espoused strategies and aligning its future fortunes with those of the good ship Windows Phone. That made sense to me then, all the sense in the world, but it doesn't any longer. What I wrote at the time was that MeeGo should either show up and blow us all away or be filed away as a project that never quite made it to fruition. The cause of my current disappointment lies in the fact that MeeGo has now indeed been shown to be a thoroughly compelling OS, but Microsoft Nokia decided to treat it like the failed experiment it seemed to be back then. Of course, I'm writing with the benefit of hindsight and after using the N9 for only a few hours, but on the other hand, Stephen Elop was able to see exactly where MeeGo was a few months ago whereas the rest of us didn't. So why did he move away from it? Going back further in time, I recall getting to grips with the first functional prototypes of Nokia's N8 almost exactly a year ago. The Symbian software on board was laggy, buggy, and a few light years away from catching up to the fineries on show from iOS and Android. Telling the world that that OS is a dead end is unproblematic, but convincing us that the faultless, buttery smooth operation of the N9's MeeGo installation doesn't have a future is far less so. In its Harmattan implementation, Nokia has reduced the smartphone user experience to three central pillars -- notifications, apps, and multitasking -- and turned out a UI that's functional, quick, and right up to date with the very best alternatives. If even a small proportion of this vision was available to Elop when he decided to leap into Steve Ballmer's open arms, could he not have kept his nerve and stood by it? The N9's basic foundations are beautifully arranged and executed, and anything it may lack in extended functionality could've come over time -- which offers almost a mirror image of the pre-Mango Windows Phone OS that he signed up for in February. The question, therefore, persists: why did Nokia abandon such a promising platform? As much as we'd like the answer to contain some wild conspiracy about trojan horses and unethical practices, the likeliest justification comes from a Bloomberg article that came out earlier this month. It detailed a January meeting between Stephen Elop and Nokia's Chief Development Officer Kai Oistämö, which would set off a sequence of events that included an in-depth look at Nokia's MeeGo roadmap, interviews with senior engineers on the team, and a few expletives sprinkled along the way to the realization that the company's desire to stick with the OS it'd been nurturing for so long wasn't financially viable. The emperor, as Oistämö put it, "had no clothes." The triumphant arrival of the N9 inevitably undermines that rationale today, but let's remember that it hasn't started shipping or selling yet. So the idea that MeeGo wouldn't be ready in time to keep the company competitive remains credible for now, though it disregards a more subtle point about what this new smartphone represents. The N9's big appeal is about the overall user experience, which is far less time-sensitive than a spec-centric device like the latest Android superphone. Even if it ships a few months from now, the N9 won't feel out of date (its OMAP3630 processor is already dated, showing just how refined and frugal the software on board is) and is still likely to offer an experience that's unique to Nokia. That, along with the expected ability to run Android apps via Myriad's Alien Dalvik software, will be happening even without Nokia committing all its resources to MeeGo, however the subsequent and nowadays requisite third-party developer support (in other words, the creation of a functionality-extending ecosystem) likely won't. 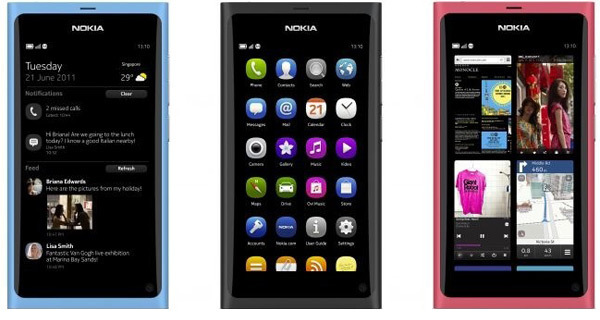 If Nokia isn't fully invested in MeeGo and Qt, why should you be? And that, dear friends, is why the delights of the N9 lead me to despondency. It's a terrific phone that's got me legitimately excited to use it, but its future is clouded by a parent that's investing its time and money into building up a whole other OS. MeeGo, and in particular its Harmattan variety, looks set to become the unfortunate victim of the cutthroat economics that dominate competition in the smartphone realm today. Which would be a damn shame considering the wonderful concepts it espouses. Did Nokia jump ship too early? After spending some quality time with the N9, I'd say so.